Pay as you get on the bus or be prepared to show proof of having paid the correct fare and/or ID for reduced or free fare. Designated seats at the front of every bus are reserved for seniors and customers with disabilities. Please surrender your seat to these customers when they board. Respect those who will ride after you. Keep your feet off the seats and take litter off with you when you leave. You’re welcome to bring your morning coffee with you. Just make sure it’s in a container with a sealed lid – and drinks with straws are NOT considered to be a sealed container. Be sure to take the container off the bus when you leave. Interfering with the safe operation of a transit vehicle is not only not smart, but hazardous to you and everyone else. Groove, jam, rock out – just realize that it’s your own soundtrack. Don’t share it with others. Just like in stores and other businesses, customers without shirts or shoes will be refused service. Your bag or bags belongs on your lap, not taking up the seat next to you. If you’re standing, make room by moving to the back of the bus. Ensure strollers/walkers are folded and placed between seats. Finally, for their safety, small children need to be held. There is no smoking on buses, in bus shelters or in transit facilities (including e-cigarettes). If you must smoke, please do so at least 25 feet away from the bus, bus shelters, and/or transit facilities. If you talk on your phone, remember that you’ve got an audience. Be mindful of your language, keep your voice low and your call brief. Using profanity or derogatory statements is not tolerated on buses. Use of this language can get you removed from the bus. Pets are welcome on buses as long as they are kept in animal carriers; service animals are exempt. Animals are not allowed on the seats. In accordance with the requirements of the U.S. Department of Transportation as set forth in 49 C.F.R. Part 26, as amended, Greeley-Evans Transit hereby notifies the public that it is recommending the following Disadvantaged Business Enterprise (DBE) goal for applicable professional services and construction procurement contract during federal fiscal years 2016-2018, beginning October 1, 2016 and ending September 31, 2018. The overall total DBE goal for federal fiscal years 2016-2018 is 1.3%. 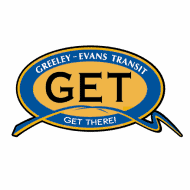 Information pertaining to this goal and a description of how it was selected is available for inspection from 8:00 A.M. to 4:00 P.M. MST at the City of Greeley Transit Services Division Office, 1200 A Street, Greeley, CO. Written comments on this goal will be accepted for 45 days from the date of this notice. The comments are for informational purposes only and may be sent to Greeley-Evans Transit, 1200 A Street, Greeley, Colorado 80631 or to the Regional Civil Rights Officer, Federal Transit Administration, Region VIII, 12300 West Dakota Avenue, Suite 310, Lakewood, CO 80228-2583.